Sehr schönes Apartment, toller Service und das ganze zu einem super Preis! Vielen Dank dafür! The apartment was in a good location clean and comfortable. This superb apartment, in a recently renovated building of holiday rental apartments, is a fantastic choice for those looking to explore all that Barcelona has to offer. 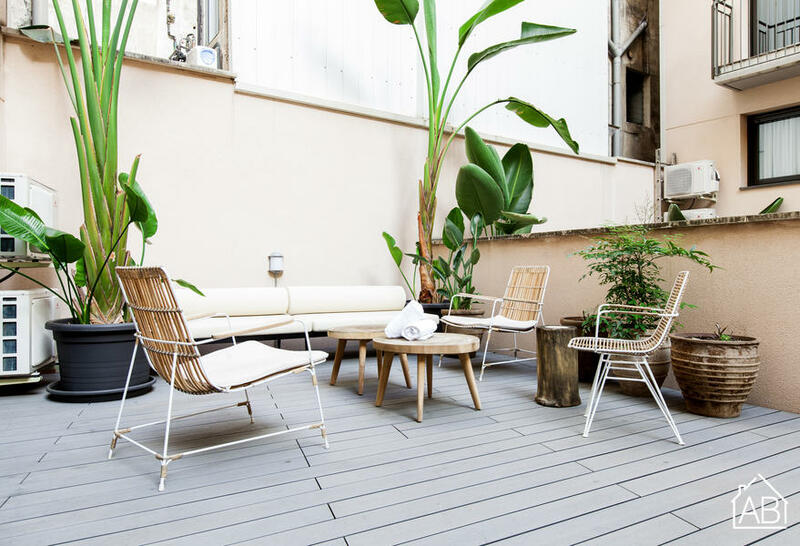 It is situated right in the city centre of Barcelona, in the Eixample area, conveniently located just a 10-15 minute walk from some of the best sights and most well-known streets in Barcelona, such as ro Las Ramblas and Passeig de Gràcia. The neighbourhood has many great restaurants and bars, as well as plenty of supermarkets. You can easily reach other parts of the city and the suburbs via public transport from the apartment, with two metro stops and several bus stops nearby. This luminous, air-conditioned apartment has 1 bedroom and 1 bathroom with massaging shower, allowing up to 4 guests in total to stay here. What´s more, there´s even a communal terrace with tables, chairs and sun loungers for you to enjoy. The kitchen comes fully-equipped with all the appliances and utensils you´ll need to prepare your favourite meals. There are plenty of amenities in this fabulous apartment, such as a washing machine, dishwasher, free WiFi and a flat-screen satellite TV, making this an excellent option for your stay in Barcelona. Please note: There is a parking space available for this apartment at 20 EUR/day. Please contact us to reserve it in advance. Please contact the AB reception for further information on how to gain access to the communal terrace.